“What happens to a dream deferred?” Jiro Horikoshi (Gordon-Levitt), protagonist of Hayao Miyazaki’s lyrical biopic The Wind Rises and designer of the infamous A6M Zero warplane, confronts this question in childhood. Plagued by poor eyesight, thereby unable to fly planes, Jiro can only take to the skies in his dreams. In the film’s opening scene, he climbs atop his country home, scrambles into a birdlike one-seater, and soars effortlessly across vivid meadows teeming with busy extras. The dream sequence is vintage Studio Ghibli, packed with bright color and soft, fluid designs. As in other Miyazaki films, including Howl’s Moving Castle and Spirited Away, the film’s opening launches us immediately into the realm of myth, where archetypal desires are rendered concrete via the supernatural’s intrusion upon normal, daily life (1). Flight is one of Miyazaki’s favorite storytelling devices, and miraculous enough in its own right to bring Icarus, the Crow and other figures bubbling to the surface of any narrative. Likewise, Jiro’s feathered aircraft is pure fantasy given form. Unfortunately, our hero’s ascent is barred by an oncoming storm cloud bursting with anthropomorphic bombs — a portent of the role Jiro’s designs will eventually take, and a reminder of the fragility of ambition and the extent to which innocent desires can become corrupted by outside forces. Rather than allow his dream to sag or shrivel, Jiro becomes inspired by an Italian designer named Caproni (Stanley Tucci) to build planes rather than fly them, setting him down a path that will eventually lead to the design of one of the most feared killing machines of the Second World War. Heedful of Caproni’s words and anti-belletristic intent, Jiro adopts an idealistic attitude rooted in a sense of beauty. In the dreamscape, the Italian designer walks along the wings of his candy-colored planes, wrapped in canvas daubed with his country’s national colors, and the boy is inspired to create something just as wondrous. Jiro is courageous enough to hurl himself into situations that get him into trouble, befitting a monomythic child-hero. In an early scene, he defends a smaller schoolmate from a few bullies, suffering a black eye in the process and demonstrating an unfailing, earnest sense of right and wrong. It is his selflessness that defines his actions during the great Tokyo earthquake of 1923, a disaster that levels the city and leaves the caretaker of a young girl named Naoko (Blunt) with a broken leg. Never to fear — Jiro and his slide rule make a handy team, and a neat splint is born, as well as the spark of a romance that is both inevitable and doomed. It is in the glimpses we get of Jiro’s career at Mitsubishi where his destiny becomes more and more apparent. Given to daydreaming (perhaps his only character flaw), loose pages swirl around his drafting table as he fantasizes, giving birth to entire fleets of matte-white, mannequin-like aircraft. The blank planes are like blocks of marble awaiting a master’s hand, and since Jiro is able to find inspiration for his designs even in mackerel bones, we get the sense that we are on a dead-ahead course. While the meat of the story is concerned with destiny and devotion to a cause, what the film doesn’t tell us is exactly where Jiro’s fascination with airplanes comes from. Sure, he yearns to fly his little gull-wing plane over the meadows and to please Caproni, but there doesn’t seem to be a concrete force shaping this desire beyond a kind of appreciative monomania. The line, “I just want to make beautiful planes” is repeated, mantra-like, at several crucial junctures: when Jiro returns to Tokyo in the wake of the earthquake, when he’s needled by fellow-engineer Honjo (Krasinski) about the deadliness of their creations, when staring down the barrel of Naoko’s death from tuberculosis. It’s a catch-all phrase that, dramatically speaking, leaves the narrative wanting for something more substantial, something with higher stakes. If this were a Hollywood film, we might get glimpses of Jiro’s father leaving for the front, a tear dripping onto his medals, and of a pair of military men bowing deeply when his mother answers the door. But it isn’t. Miyazaki has always been partial to depictions of children because their innocence and idealism prove able vehicles for his most well worn themes (2), and Jiro is no exception. The film doesn’t deal in how ambition is generated, but how it persists through overwhelming circumstances (3) and how it can be construed and misconstrued freely, by both the dreamer and those watching as he attempts to materialize them. 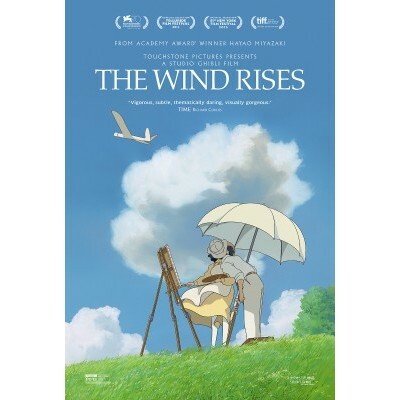 Even for a tale that is ostensibly biographical, The Wind Rises engages in such a playful sense of whimsy and serendipity that the need to address Jiro’s hand in the deaths of millions is rendered moot. This film, despite all the uproar (4), is not political. It’s a fable of sorts. One storytelling device that illustrates this concept is Caproni. He appears several times throughout the movie and Jiro’s life, dressed impeccably, not a mustache-hair out of place. His planes are huge and fantastic, with outlandish designs and beautiful women bursting from between the fuselage. At one point Jiro and Honjo learn of his real-world failure to build a seaplane, yet this does nothing to tarnish dream-Caproni’s image. It’s his attitude that proves infectious and his ideals that prove enduring. As for Jiro’s perceived lack of reluctance to build killing warplanes, consider the historical context of Japan’s aeronautics industry. Each contract mentioned in the film is dangled before Mitsubishi and its competing firms by the military as a prize, ostensibly leading to riches and acclaim. When Mitsubishi’s initial carrier fighter designs prove faulty, they move on to building a heavy bomber, because they’re following the scent. Germany is building all-metal planes the size of apartments, and the grandeur of their factories is notable, to the visiting Japanese designers, not for their intimidating security but for their sheer size — the hangers are the size of whole factories! The entire world is barreling towards war, leaving Jiro inculpable except in the eyes of history. It is not insensitive to say that this looming threat spurred immense leaps in scientific discovery and creativity, despite all the carnage wrought as a result. In a similar fashion to Jiro’s “beautiful planes” mantra, the Valéry quote alluded to by the film’s title (5) is repeated by Caproni, the film’s Vergil, at strategic intervals in Jiro’s life, as if to affirm the way in which his noble intent is molded by the circumstances of his adult life. If a rising tide lifts all boats, then a rising wind must surely buoy aircraft. Is Jiro’s myth tragic then? Fraught with quiet angst, maybe. But, watching Jiro rub elbows with Caproni one more time in the dreamscape, leaving behind a field strewn with the twisted wreckage of downed aircraft, we realize his triumph as a squadron of Zeros drifts silently by, its pilots saluting their outfitter. It is a short-lived triumph of the Japanese war effort, and of the field of aerospace engineers in the creation of one of the fastest, most maneuverable planes of its time. But mostly it’s Jiro’s triumph, having finally brought forth his masterpiece from the feathery marble of his dreams. Editor’s Note: This month’s Cinemashrink is guest-written by True Shields. (1) (1) In Howl’s Moving Castle, themes of pacifism and feminism rub elbows with the old ‘love transcends age/station’ chestnut. Spirited Away primarily deals with the loss of innocence, which, if you consider Chihiro’s relatively stoic reaction to her parents being transformed into swine, might be an understatement. (2) (2) Environmentalism, pacifism, earnestness, to name just a few. (3) (3) Tokyo’s earthquake, tuberculosis, impending war, etc. (4) (4) Jiro’s enthusiasm in the face of all-too-obvious hints that he’s building killing machines has been construed and misconstrued by various media outlets in Japan and abroad as callous, insensitive and untimely. I will do my best to avoid leaping into that mosh pit. (5) (5) “The wind is rising… we must attempt to live.” From Le cimitiére marin, or The Marine Cemetary. A fine review. I had not heard of this film or this story but this review makes me want to. I hope you write more of these reviews, factual,intelligent, and original.